Antique, vintage and classic car parts and accessories includes, original equipment manufactured (OEM) auto parts, aftermarket auto parts, remanufactured auto parts and used auto parts. Accessories come from all over the world and are therefore available in a wide variety of quality, that sell for a wide range of prices. Generally OEM parts are the most likely to perform according to the vehicle manufacturer's specifications and in some cases are required to maintain their warrantee, but not always. Many aftermarket manufacturers make quality parts that can be substituted for OEM parts without penalty. Aftermarket manufacturers also provide many unique accessories for antique, vintage and classic cars that are not available from the original manufacturer, such as fancy horns, light and other beauty enhancements. The following companies specialize in new, used and remanufactured parts and accessories for brass, antique, vintage and classic cars, hot rods, muscle cars, trucks and vans, motorcycles, motor homes and trailers. If you have a concern or comment about a listing please contact our webmaster@antiquecar.com. http://www.carguygarage.com/: Car Guy Garage makes the garage another room in your house. From garage cabinets, to lighting, flooring and decor, this family run business knows how to make you feel at home in your garage and shop. Give them a call toll free at 800-736-9308 and ask for a free 3D design of your garage. http://www.dennis-carpenter.com/: Dennis Carpenter has been producing restoration parts for antique and vintage Ford vehicles for over 40 years. And he's good, so good that Ford gave hime approval to use some of their original tooling. Dennis Carpenter is a family owned company and they will be happy to discuss your particular needs. They now make rubber seals, rubber bumpers, die cast chrome parts and metal stamped parts for early Ford vehicles. They are very proud to say that 85% of their rubber products, 95% of our their stamped metal parts, 99% of their plastic injected parts and 100% of their Ford tooling parts are made in the U.S.A.
http://www.bobdrake.com/: Bob Drake got started by trading vintage Fords and parts at swap meets and his company now employees over 40 people and produces over 7,000 Ford products. They are an industry leader in remanufacturing parts for vintage and classic Ford cars made between 1932 and 1948 and Ford pickup trucks made between 1932 and 1966 . Many of their parts are based on original samples from Bob's extensive collection of Ford memorabilia. They are also licensed by Ford to build thousands of early Ford parts. They even have patents for custom parts they designed and built to solve well known problems. They offer a 600 page parts catalog. http://www.opgi.com/: Dave Leonard started Original Parts Group Incorporated from his garage in 1982 and as General Motors dropped the production of more and more parts the inventory at OPGI grew. They now offer the best reproduction and aftermarket parts and accessories for antique, vintage and classic GM A-bodies that includes everything from books to hard-to-find moldings, and they promise the very best prices and service. They have over 100 employees working in a 50,000 square foot warehouse in Seal Beach, California and they offer a free catalog and frequent shopper awards. They will also match any retail advertised price. http://www.cokertire.com/: Coker Tires has been in business since 1958 and specializes in supplying tires and wheels for antique and vintage vehicles, custom cars, hot rods, trucks and motorcycles. They sell tires made by Firestone, Michelin, U.S. Royal and BFGoodrich and will ship anywhere in the world. Coker Tire offers an Extended Tire Protection (ETP) plan that replaces road damaged tires for free for five years (or the life of the tread) and will even pay for the shipping. They attend over 40 car shows and related events every year and their catalog includes a wide variety of antique car memorabilia. Their headquarters in located on the south side of Chattanooga, Tennessee, and their showroom/museum is well worth a visit. http://www.restorationspecialties.com/: Restoration Specialties & Supply company began as a small antique car parts supplier in 1974 and have been growing ever since. They are now a leading supplier of hard to find antique and street rod restoration parts and stock such things as window channels, weatherstripping, special clips, fasteners and screws and much more. They pay close attention to details to assure that your order arrives as you would expect it and they have an online catalog that you can download as a PDF file. If you have questions or need help they will be happy to discuss your project and will go the extra mile to find hard to locate parts. http://www.macsautoparts.com/: Mac's Antique Auto Parts was started in 1978 by Douglas McIntosh and has been serving Ford restorers ever since. 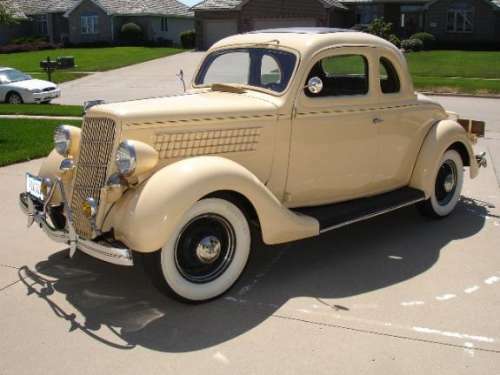 Today they specialize in Ford Model T and Model A parts, hot rod parts and parts for most all classic Fords, Mercurys, Lincolns and Edsels built between 1909 and 1979 - including helpful manuals and Cartouche line of upholstery products. They are licensed by Ford to produce over 200 trademarked parts. Mac's is an online mail-order company located in Lockport, New York, and offers a free full-color catalog. http://www.universaltire.com/: Universal Vintage Tires has been selling tires for antique, vintage and classic car collectors since 1968. They sell a wide variety of tires such as Universal, Lester, Excelsior and Avon and are now the exclusive dealer for Dunlop vintage tires. Their facilities and showroom are located in Hershey, Pennsylvania, and is open to the public. https://www.factoryinteriors.com/: Factory Interiors is a worldwide distributor of automotive interior parts and accessories with a focus on custom fit replacement carpet kits, floor mats and trunk mats. They have access to over 40,000 flooring and seating applications to fit vehicles ranging from the 1940s to present day models, designed to match original colors and materials they are custom made to meet or exceed OEM specifications. Their carpet kits and floor mats are manufactured in the USA and are made using the original vehicles floor pan as a mold to ensure an accurate fit. Factory OEM Parts is a distributor of General Motors automotive parts and accessories specializing in hard to find, OEM parts for a multitude of vehicles. Our largest product ranges include parts for Corvettes, Hummers, Cadillacs and Kodiak/Topkick trucks. They operate out of a 30,000ft warehouse in St. Charles, MO, just outside of St. Louis and consistently add to their extensive product range. https://parts.cat.com/en/catcorp/batteries: You need to have confidence that your battery will start your equipment every time, even in the most adverse environments and extreme temperatures. That is why Cat® Parts is dedicated to manufacturing only the best batteries and auto parts. With over a hundred batteries to choose from, Cat® is here to provide for all your battery needs, from vehicles to boats to machinery. http://www.classictruckconsoles.com/index.html: Classic Truck Consoles was formed to market the original design of a center console for 1967-1972 Chevy trucks.our company focuses on delivering innovative fiberglass products for the automotive aftermarket. If you have an idea for an application of our consoles, please let us know as we enjoy delivering useful products for our customers. http://www.gaslightauto.com/: Gaslight Auto Parts specializes in antique, vintage and classic parts for Ford vehicles built between 1909 and 1948. They also sell books, decals, hats, posters and enameled signs. They have been in operation since 1962 and offer an online catalog as a PDF file. They are located in Urbana, Ohio. http://www.restorationstuff.com/: The Restoration Supply Company has been in business since 1972 specializing in parts for horseless carriages and boats build prior to World War I. Most of their parts are generic, such as lights and mirrors but you will also find near OEM knobs, door handles and electrical components and they have a good supply of brass and aluminum stock. The company is located in Escondido, California, and offers a free online catalog. http://www.snydersantiqueauto.com/: Snyder's Antique Auto Parts specializes in parts for Model A and Model T Fords and AA Ford trucks. They have been in business of reconditioning, manufacturing and selling Ford parts for over 40 years and offer an online catalog, or will be happy to mail you a printed one for free. They are located in New Springfield, Ohio, and have gift certificates. http://www.bobsautomobilia.com/: Bobs Automobilia has been in operation since 1979 and specializes in new and used parts for 1920 to 1957 antique, vintage and classic Buicks. They have over 3,500 parts available and offer a free online catalog. They are located on the west coast of the United States. http://www.classicchevroletparts.com/: Classic Chevrolet Parts specializes in obsolete and classic auto parts for 1932-1987 Chevy Pickups, 1955-1957 classic Chevys, 1964-1972 classic Chevy Chevelles, 1964-1981 classic Chevy Camaros and 1962-1974 Chevy Novas. They have over 48,000 square feet of shopping and warehouse space, offer a free catalog and are located in Oklahoma City, Oklahoma. http://www.lucasclassictires.com/: Lucas Classic Tires sells tires for antique, vintage and classic cars, trucks and specialty applications. They have been in business since 1957 and will be happy to discuss your special tire needs. They are located in Long Beach, California. http://www.mytarp.com/: My Tarp offers traps and covers for antique, vintage and classic cars and trucks in vinyl, canvas and mesh. They also have tarpaulins, outdoor screes and a wide variety of covers to meet your needs. And if they don''t have it they will make it to your specifications. Mytarp.com has thousands tarps in stock and their goal is to give you the lowest prices and best service found on the Internet. Give them a call if you have questions and their knowledgeable staff will help you decide on the most appropriate type of tarp for your needs. http://www.jobbersinc.com/: Jobbers is a wholesale automotive distributor specializing in the sale of engines, parts and equipment for antique, vintage and classic cars and trucks. They specialize in reconditioning and rebuilding diesel and gasoline engines by renewing, re-using and recycling everything they can. They have over 100,000 square feet of new, reconditioned and used diesel and gas engines intended for vehicles, marine and agricultural purposes and they specialize in Allis Chalmers, Caterpillar, Climax, Continental, Cummins, Detroit Diesel, Deutz, Hercules, International Harvester, Isuzu, John Deere, Mack, Massey Ferguson, Mercedes, Navistar, Perkins, Waukesha and Yanmar engines. www.automotive-online.com/: Automotive Online offers a wide variety of information about automotive body polishes/ paints, automotive seats, audio, etc. and contact details of auto accessories manufacturers and suppliers from all over the world. Their website also includes a comprehensive and user-friendly global automotive parts manufacturers directory that lists manufacturers, exporters, wholesalers, suppliers and traders of various products and services used in automobile industry, including their contact information and Internet address. The directory is searchable by product or company name and provides information about various auto parts suppliers like those who make gaskets, fasteners, springs, valves, gauges, bolts, screws, nuts, seals, steering parts and you can list your company for free here: automotive-online.com/list-your-business.html. www.BatteryCentralMall.com/: Battery Central Mall offers authentic reproductions of antique and classic car Script batteries as well as 16-volt racing and audio high performance batteries, and they ship Script batteries for free. The Battery Central Mall specializes in batteries of all shapes and sizes for most every antique, vintage and classic car and truck and many are discounted below retail prices. If they don't have want you want they will try to find it for you and their lines include manufacturers such as Gill, Duracell, Energizer, Eveready, Yuasa, PowerSonic, CSB, XS Power, Rhino, Odyssey, Tadiran, Sanyo, Saft battery and more. They are a family operated business that has been in operation for over 30 years and you can contact them at sales@BatteryCentralMall.com. www.carcoverkingdom.com/: Car Cover Kingdom offers CoverCraft car covers and much more, such as car and truck horns and emergency vehicle lights. CoverCraft covers are among the best for quality and fit and they make them for everything from antique, vintage and classic kit cars to motor homes. They will also make covers to your specifications. CoverCraft has over 50,000 listings in their computerized pattern library and adds new patterns every week. You can contact them at Sales@CarCoverKingdom.com. www.carcoversdirect.com/: Car Cover Direct is an online retailer of car covers, truck covers, and SUV covers. They also have tonneau covers and convertible interior covers and thousands of in-stock products. They are proud of their attention to detail and have an established track record. They sell CoverCraft Industries covers, have been online since 2001 and offer fast and free shipping. At Car Covers Direct they view each customer as a relationship, not just a sale and are always willing to help solve unique issues. www.shiny-hiney.com/: Shiny Hiney is a source of LED taillights for classic and custom cars and trucks. They are a family owned business and are car enthusiasts who understand the need for dependable and affordable hardware. If you don't see what you want on their website just let them know and they will try to find it for you. Let them make your ride light! You will see that their website is family-friendly (they are SafeSurf rated) because they understand that many restorations are family projects. Take a look at their website to see what they have to offer. You can contact them at wade@shiny-hiney.com. www.superlambauto.com/: Super Lamb Auto offers sheepskin seat covers by Superlamb, who specialize in making custom sheepskin seat covers for most all makes of antique, vintage and classic models of vehicles. Sheepskin covers are warm in the winter and cool in summer. Super Lamb Auto offers outstanding customer service and support from their headquarters in San Diego, CA, where they have been in business since 1978; and they are now one of the largest suppliers of sheepskin products in the Country. The CEO is from New Zealand and knows sheepskins. They also operate superlamb.com which offers sheepskin footwear. You can visit their retail store showroom or contact them through a form at superlambauto.com/contact-us.aspx. http://www.carxenonhidkits.com/: Car Xenon HID Kits sells high quality German High-intensity Discharge (HID) headlamp Kits for all makes of antique, vintage and classic vehicles. They should be your first stop for all your HID kits needs because they offer the biggest selection of all different types of HID Conversion Kits that fits all car models on the market. CarXenonHIDKits.com offers 5-star customer service and all of their products are tested multiple times before being sold. They sell HID kits for all makes and models of antique, vintage and classic cars, motorcycles, trucks, Suvs and Vtts on the market today and you will also get free shipping and a lifetime warranty. All orders are shipped the same day if placed before 5:00PM Eastern Time. If you have any questions you can contact them here: Info@carxenonhidkits.com. http://www.bumpshox.com/: Bump Shox sells a custom license plate frame that is also a car bumper protector. Front bumper guards and rear bumper protection can help prevent costly bumper damage and they offer several solutions that range from stick on bumper guards to the more rugged welded steel bumper guards. The BumpShox looks like a license frame on steroids and comes in three sizes to choose from. http://www.syntheticoilhq.com/: Synthetic oil Headquarters is an Amsoil Synthetic Oil website that offers Amsoil for all antique, vintage and classic cars, boats, motorcycles, and snowmobiles. They have the full line of Amsoil products and will send you a free catalog upon request. Synthetic oil and synthetic lubricants can save you money by increasing fuel economy and requiring fewer oil changes. Amsoil is the original synthetic oil and still considered among the best. You find proof in the comparison tests on their website. http://www.oilfiltersonline.com/: Oil Filters Online specializes in affordable auto maintenance supplies for antique, vintage and classic vehicles that can be shipped fast and cheap: such as oil filters, air filters, fuel filters, spark plugs, brakes, oxygen sensors and more. Oil Filters Online is a subsidiary of Egghead Ventures, LLC. and the founders have a combined 30 years of experience in product design, engineering and manufacturing in the consumer products arena. You can contact the folks at Oil Filters Online here: support@OilFiltersOnline.com. www.newdodgeparts.com/: New Dodge Parts offers genuine Dodge parts and accessories. They are the leading supplier of genuine Dodge parts for antique, vintage and classic Dodge cars online, located in South Kernersville, NC. They have become a trusted and reputed source for Dodge replacement parts and accessories online at discount prices in the United States and specialize in Original Equipment Manufactured (OEM) parts and accessories designed and engineered only for Dodge vehicles. OEM parts are the only ones that are manufactured according to the standards of the manufacturer. Plus, they offer a nation-wide warranty protection plan. www.customhitchme.com/: Custom Hitch Me carries a variety of accessories to enhance and secure your vehicle and trailer. That includes custom chrome and painted hitch covers, hammerhead hitch covers, trailer locks and drop Mounts. You can contact them at support@customhitchme.com. : License Plate Frames sells custom and blank license plate frames for antique, vintage and classic automobiles and motorcycles. They have been in business since the early 1990s and have gained the experience necessary to bring the most sought after promotional products at the absolute lowest prices to their customers. Their in-house production capabilities include: laser engraving, full color process printing, pad printing, screen printing, metal stamping, and assembly operations. You can contact them at info@imprintproduct.com. www.customlicenseplates.com/: Custom License Plates allows you to add your personalized message or corporate logo to their authentic looking license plates or they can produce your own original design in a variety of materials. Add your personalized message or custom logo to an authentic looking license plate. All U.S. States, European and Japanese. You can contact them at info@customlicenseplates.com.